Petron group of companies in Malaysia operate an oil refinery and a petroleum marketing business that encompasses over 550 retail fuel stations nationwide. We are also a major industry player in marketing of commercial petroleum related business, including LPG, aviation fuel and lubricants. Under new management, we are embarking on expanding our business and upgrading our facilities to provide better customer service. We operate in a dynamic and challenging environment that calls for exceptional performance. Our most valued asset is our people - enterprising professionals driven by teamwork, innovation, excellence, integrity and fairness. Petron Corporation is an emerging and rapidly evolving Asian oil company. We share the same roots as ExxonMobil in Malaysia, tracing our lineage to 1933 with the formation of Standard Vacuum Oil Company. Petron has evolved to meet the challenges of the dynamic markets and today, we are the largest oil refining and marketing company in the Philippines, supplying nearly 40% of the country’s oil requirements. In 2011, Petron marked its foray into Malaysia with the incorporation of its holding company, Petron Oil & Gas International Sdn Bhd and the acquisition of ExxonMobil downstream subsidiaries in 2012. 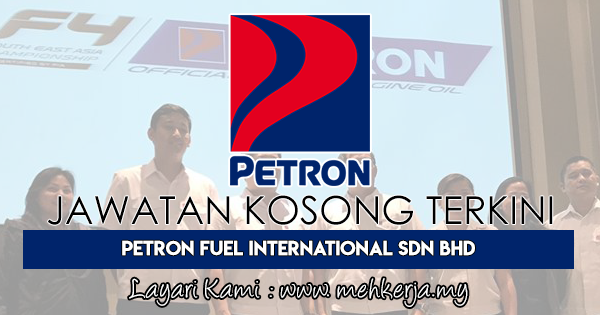 Petron Subsidiaries in Malaysia comprise of Petron Malaysia Refining & Marketing Bhd (formerly known as Esso Malaysia Berhad), a public listed company listed on Bursa Malaysia; Petron Fuel International Sdn Bhd (formerly known as ExxonMobil Malaysia Sdn Bhd); and Petron Oil (M) Sdn Bhd (formerly known as ExxonMobil Borneo Sdn Bhd). 0 Response to "Jawatan Kosong Terkini di Petron Fuel International Sdn Bhd - 12 September 2018"